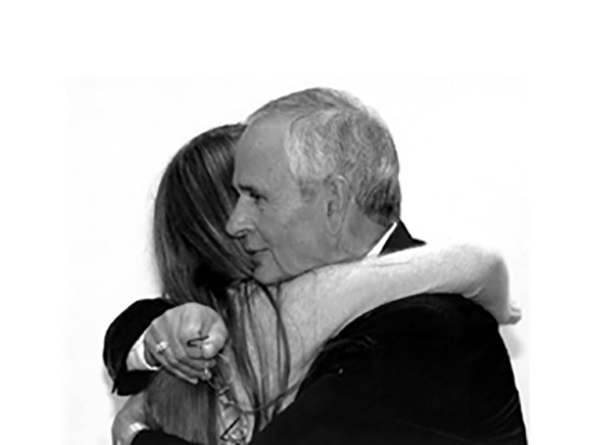 Above: John Harms embraces his granddaughter, Elizabeth Ashley Moore, after his retirement as president of Western Community College. As a young person, Sen. John Harms said he spent the summers outside hunting, fishing and playing sports. The sun would turn his skin a deep shade of brown. At the grocery store where he worked during the summer, migrant workers from Mexico and other Spanish-speaking countries would speak to him in Spanish, thinking he would be able to understand. Although he couldn’t understand their language, Harms said he understood what it meant to be different in a small community. The son of a Greek immigrant, Harms said he had always been taught to accept people for who they are, not what they are. Experiencing discrimination because of his ethnicity was surprising to him at first, he said. Harms attributes his love of cooking to his father, who ran a restaurant in Morrill, where Harms grew up. It’s not uncommon for the kitchen to be filled with exotic scents whenever Harms is cooking. Greek, Hungarian and Mexican dishes are some of his favorite foods. He said his three children learned early to appreciate different flavors. “They either starved to death or learned to try new things,” he said, laughing. His own desire to experience new things extends beyond the kitchen. With a doctorate in higher education, Harms has spent much of his life learning new things. “There’s some level of excitement in constantly learning,” he said. This is a passion he also has passed on to his children. His oldest daughter, Stacey Moore, is a special education teacher in Scottsbluff. His son Nick is one of the managers at Team Chevrolet and his youngest daughter, Suzette Luster is a speech pathologist in Greeley. Harms has served in administrative positions at several Nebraska community colleges. He started his career as Director of Housing and Financial Aid at Chadron State College. Later, he became Dean of Students, and then Dean of Instruction, at Norfolk Junior College (now Northeast Community College). He served as president of McCook Community College. Most recently, he was president of Western Nebraska Community College for 30 years and is now retired. Before he was an administrator, Harms taught at Gering High School for three years. His experience there led him to pursue more education because he wanted to be able to play a more active role in changing education policy, he said. His love of learning didn’t develop right away. He said he used to get in a fair amount of trouble at school growing up. But, living in a tight-knit community, he didn’t get away with much. “I knew if I did something, Mom would know about it before I got home,” he said with a smile. Harms said his favorite academic subject is biology. He enjoys teaching his five grandchildren, ranging in age from eight to 16 years old, about the plants and animals they see. He said any time he and his wife, Patricia, can spend with their grandchildren is time well spent. “They’re the best thing that’s ever happened to us,” he said.